Welcome back to Constellation Friday! Today, in honor of our dear friend and contributor, Tammy Plotner, we examine the Auriga constellation. Enjoy! One of these is the constellation of Auriga, a beautiful pentagon-shaped collection of stars that is situated just north of the celestial equator. Along with five other constellations that have stars in the Winter Hexagon asterism, Auriga is most prominent during winter evenings in the Northern Hemisphere. Auriga also belongs to the Perseus family of constellations, together with Andromeda, Cassiopeia, Cepheus, Cetus, Lacerta, Pegasus, Perseus, and Triangulum. The name Auriga is derived from Latin, and means “the charioteer”. Auriga is associated with many characters out of Greek mythology, the foremost of which is the mythological hero Erichthonius of Athens, the son of Hephaestus who was raised by the goddess Athena. Erichthonius was generally credited as being the inventor of the quadriga (the four-horse chariot) which Erichthonius used in the battle that made him king of Athens. In honor of his ingenuity and heroic deeds, Zeus raised him into the heavens, where he rode a chariot resembling the Sun’s chariot. Auriga is also described sometimes as Myrtilus, the son of Hermes and the charioteer of Oenamaus – a Greek god who was himself the son of Ares. This association is supported by depictions of the constellation which rarely show a chariot, as Myrtilus’s chariot was destroyed in a race intended to win the heart of Oenomaus’s daughter (Hippodamia). After being killed by a competing suitor, Myrtilus father Hermes placed him in the sky. Yet another mythological association is Theseus’s son Hippolytus, who was ejected from Athens after he refused the romantic advances of his stepmother Phaedra. He was killed when his chariot was wrecked, but revived by Asclepius. Regardless of Auriga’s specific representation, it is likely that the constellation was created by the ancient Greeks to commemorate the importance of the chariot in their society. Auriga’s brightest star (Alpha Auriga) is Capella, which also happens to be the sixth brightest star in the night sky (magnitude 0.08). 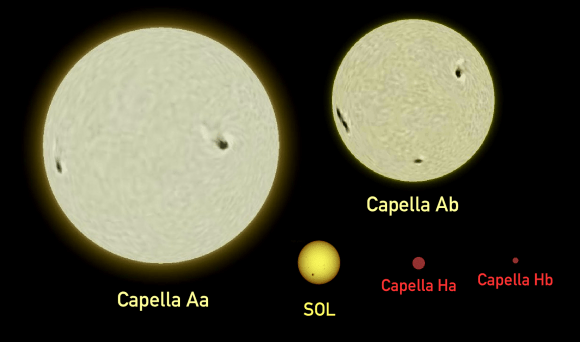 A spectroscopic binary that consists of two yellow giant stars (the primary a G-type star, the secondary a G-type giant) Capella is 43 light-years away from Earth. It’s traditional name is a reference to its mythological position as Amalthea, the mythological she-goat from Greek mythology. It’s Arabic name (al-‘Ayyuq) also translates to “the goat”, and its Sumerian name (mul.ÁŠ.KAR) means “the goat star”. Beta Aurigae (Menkalinan, Menkarlina) is a bright A-type subgiant. It’s Arabic name comes from the phrase mankib dhu al-‘inan, which means “shoulder of the charioteer”. Menkalinan is an eclipsing binary star made up of two blue-white stars that are 81 light-years from Earth. The double nature of this star was discovered in 1890 through spectroscopic analysis, which made it the second spectroscopic binary to be discovered. Other bright stars include Gamma Aurigae, a B-type giant that has since been reclassified as belonging to the Taurus constellation – making it Beta Taurid. Iota Aurigae (aka. Hasseleh and Kabdhilinan) is a K-type giant that is located 494 light-years away from Earth. The traditional name of Kabdhilinan, sometimes shortened to “Alkab”, is taken from the Arabic phrase al-kab dh’il inan, which means “shoulder of the rein holder”. Delta Aurigae, the northernmost bright star in Auriga, is another K-type giant that 126 light-years from Earth. Though it is often listed as a single star, it actually has three very widely spaced optical companions. One is a double star of magnitude 11, two arcminutes from Delta, and the other is a star of magnitude 10, three arcminutes from Delta. Then there’s Eta Aurigae, a blue-white B-type main sequence dwarf located about 219 light years away. In the constellation, the star represents one of the ‘kids’ of the goat (Capella) held by the Charioteer. Its traditional name is Haedus II (or Hoedus II) and it comes from the Latin word haedus, which means ‘kid.’ It is occasionally called Mahasim (“wrist”), a name it shares with Theta Aurigae. Lambda Aurigae (Al Hurr) is a G-type star that is between a subgiant and main-sequence and located 41 light-years from Earth. Though older than the Sun, it is similar in many ways, which includes its mass (1.07 solar masses) and its radius (1.3 solar radii), and a rotational period of 26 days. However, it differs from the Sun in its metallicity, as its iron content is 1.15 times that of the Sun, though it has relatively less nitrogen and carbon. Zeta Aurigae is the other ‘kid’ held by the Charioteer. The star is also commonly called Sadatoni. The name comes from the Arabic phrase als-saeid alth-thani, which means “the second arm (of the Charioteer).” Sadatoni is an eclipsing binary star 790 light years distant. It consists of a red supergiant and a B8 type companion. The system’s magnitude varies between 3.61 and 3.99 with a period of 972 days. There are also five stars with confirmed planetary systems in Auriga, not to mention a white dwarf with a suspected planetary system. These include HD 40979, which has one planet – HD 40979 b. It was discovered in 2002 using radial velocity measurements on the parent star. With a mass of 3.83 Jupiter masses, the planet orbits its parent star with a semi-major axis of 0.83 AU and a period of 263.1 days. Another is HD 45350, which also has one planet, known as HD 45350 b. This world has 1.79 Jupiter masses and orbits its parent star every 890.76 days at a distance of 1.92 AU. It was discovered in 2004, also through the use of the radial velocity method. HD 43691 also has a confirmed exoplanet; HD 43691 b, a planet with 2.49 Jupiter masses that orbits its parent star at a distance of 0.24 AU with a period of just 36.96 days. HD 49674 is yet another star in Auriga that has a planet orbiting it. Much like the others, HD 49674 b was detected in 2002 using the radial velocity method. Unlike the others, it is quite small, with a mass that is 0.115 times that of Jupiter. It also orbits very close to its star, at 0.058 AU, and has a orbital period of just 4.94 days. The most recently confirmed exoplanet in Auriga is HAT-P-9-b, which was detected using the transit method in 2008. It also orbits very close to its parent star (HAT-9-P), at a distance of 0.053 AU and with a period of 3.92 days. This world has been classified as a “hot Jupiter”, with a mass that is 0.67 times that of Jupiter but a radius that is 1.4 times as large. Auriga contains three Messier objects – M36 (NGC 1960), M37 (NGC 2099), and M38 (NGC 1912) – and numerous star clusters. It also has four meteor showers associated with it – the Alpha Aurigids, the Delta Aurigids, the fainter Aurigids, and the Zeta Aurigids. The first recorded mention of Auriga’s stars comes from Mesopotamia, where it was called GAM and included most of the stars from the modern constellation. This figure was alternatively called Gamlum or MUL.GAM in the MUL.APIN – the Babylonian astrological catalog. The constellation represented either a scimitar or a crook, the latter of which stood for a goat-herd or shepherd. This tradition was carried on by Bedouin astronomers, who created constellations that were named in accordance with groups of animals. To them, the stars of Auriga comprised a herd of goats, an association which was carried on by the Greek astronomical tradition (which endured even after it became associated with the charioteer). In ancient Chinese astronomy, the stars of Auriga were incorporated into several Chinese constellations. These included Wuche, which used several of Auriga’s stars to represent the five chariots of the celestial emperors, which in turn represented the grain harvest. Another is Zuoqi, which was made up of nine stars in the east of the constellation to represent chairs for the emperor and other officials. Auriga’s brightest star, Capella, was also significant to many cultures. In ancient Hindu astronomy, Capella represented the heart of Brahma, while ancient Peruvian peoples saw Capella (which they called Colca) as a star intimately connected to the affairs of shepherds. Capella was also significant to the Aztec people, which is evidenced by the archaeological site of Monte Albán, a Late Classic settlement that contained a marker for the star’s heliacal rising. To the indigenous peoples of California and Nevada, the bright pattern of the constellation was also significant. To them, Auriga’s brightest stars formed a curve that was represented in crescent-shaped petroglyphs. The indigenous Pawnee of North America recognized a constellation with the same major stars as modern Auriga: Alpha, Beta, Gamma (Beta Tauri), Theta, and Iota Aurigae. To the northern Inuit, a constellation that included Capella and other bright stars from Auriga were known as Quturjuuk, meaning “collar-bones”. Its rising signaled that the constellation Aagjuuk, which was made up of stars from the constellation Aquila, would be rising soon. Since Aagjuuk represented the dawn following the winter solstice, and was used for navigation and time-keeping at night, it was extremely important to the Inuit. Since the time of Ptolemy, Auriga has remained a constellation and is officially recognized by the International Astronomical Union today. Like all modern constellations, it is now defined as a specific region of the sky that includes both the ancient pattern and the surrounding stars. In 1922, the IAU designated its recommended three-letter abbreviation, “Aur”, and the official boundaries of Auriga were created in 1930 by Eugène Delporte. While viewing Auriga’s stars, pay particular attention to yellow giant Alpha Aurigae, aka. Capella. It is the 6th brightest star in the sky (0.08 magnitude) and also a spectroscopic binary consisting of a G5III and a G0III that revolve each other every 104 days. Menkalinen, or Beta Aurigae, is also a spectroscopic binary. However, it rotates far faster, completing its circuit in just four days! This eclipsing binary pair makes the brightness of Beta vary. Epsilon Aurigae is also an eclipsing binary, but one that has an extraordinarily long period of 27.1 years. While it only drops by 0.8 of a magnitude, it’s dark companion is a 10-12 solar mass black hole. According to studies done by Wilson and Cameron a ring of obscuring material surrounds the black hole and accounts for the magnitude drop. Don’t skip Zeta Aurigae, either. It’s a K4 giant that’s also an eclipsing binary. It has a B8 main sequence star which revolves around it in less than 3 years. Those who have telescopes will be interested to know that some of Auriga’s other binaries can be resolved. Double star Omega Auriga can be split with small telescopes, thus allowing stargazers to see both its 5th and a 8th magnitude stars. Or try disparate double Theta Aurigae – it’s a 2.62 primary and a 7.0 secondary. For those using binoculars, the splendid Milky Way star field is rich with open clusters that are easily spotted are resolved. Open cluster M36 is a nice compression and contains about 60 stars to a small telescope. The slightly egg-shaped M38 is another easy binocular target, a very rich open cluster that is easily viewed using any instrument. 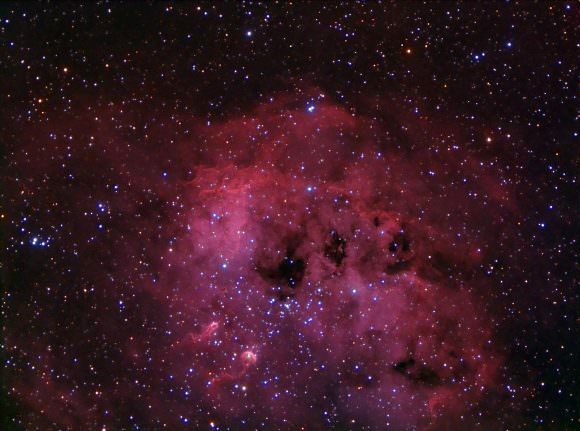 For telescopes, do not overlook IC 410. This diffuse nebula with a cluster of stars is more commonly known as the “Flaming Star”. When it comes to meteor showers, the Aurigids become active between January 31st, and February 23rd and are known for sporadic bright fireballs. From August 25th through September 6th, the Alpha Aurigid meteor stream is active, with an average fall rate of about 9 meteors per hour (but outbursts of up to 30 were observed in 1935 and 1986). The Delta Aurigid meteor stream becomes active between September 22nd and October 23rd. A good time to look for peak activity for this branch is during the week beginning on October 6th through the 15th. As always, we wish you luck in your stargazing. And know that when you find this constellation, you are looking upon an asterism that people have been designating and characterizing since time immemorial! For more information, check out the IAUs list of Constellations, and the Students for the Exploration and Development of Space page on Auriga and Constellation Families. Previous PostPrevious Weekly Space Hangout – May 6, 2016: Paul Reichert – Photography in Space!